As the world mobilizes in Haiti’s hour of need, this collection of travel stories provides insight into life before the quake. Photo, alan2. Feature photo, kretyen. This post by a traveler who volunteered in Haiti does a good job of describing the challenges that relief workers will face while trying to help the quake victims and take care of themselves. Generosity and goodwill do dry up at some point. But not the homes; they were inundated with water as recently as Tuesday. 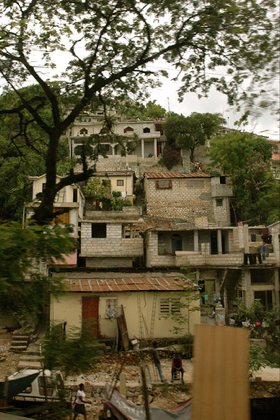 Writing in 2008, Lonely Planet founder Tony Wheeler describes Haiti as a safe and colorful destination for intrepid travelers. From balcony views of the Caribbean to streets lined with art galleries, Mr. Wheeler does a wonderful job of painting Haiti as an appealing tourist destination while still paying tribute to environmental devastation and crushing poverty. In my humble opinion, Michael Finkel is one of the 5 best travel writers of our time. His story of attempting to cross the Caribbean in the cargo hold of an overloaded boat of Haitian refugees is a stunningly courageous portrait of desperation that nearly ended in tragedy. This brief National Geographic article gives a new dimension to the old phrase “dirt poor”. The answer, of course, is that they have no other option. Matador is spearheading a major effort to get relief supplies to Haiti. For details, please read How You Can Help Haiti.